A lot of my posts recently have been about the various fires we’re trying to put out here in Boo land. The statementing debacle. The temporary halt put on our front access adaptations. The struggle to secure equipment. The last few months have been utterly exhausting. But there have been lots of good things going on, too. And today I’m finally getting round to telling you about one of the very best. The Wizzybug. Is it a wheelchair? Is it the funkiest toy car you have ever seen? Is it just about one of the most fun and life enhancing things anyone has ever invented? The answer is yes to all of these things. Take a look and judge for yourself. I heard about the Wizzybug in the spring from my lovely friend in the know over at Tough Little Cookies. To be honest, it sounded too good to be true. The Wizzybug is a paediatric powered chair for children between the ages of 18 months and around 5 (depending on growth) designed by the incredibly smart people at Designability in Bath. The NHS generally doesn’t fund powered chairs for kids under 5. Boo has an adapted buggy from wheelchair services, but of course he can only go in this where we push him and at the age of 2.5 that’s not much fun. And frankly, it’s not very forward thinking either. I will never give up on Boo walking some of the time but, realistically, he will be a chair user for some if not all of the day for the rest of his life. The idea of putting him in a powered chair for the first time at the age of 5 seems nonsensical to me. Everything we know about cerebral palsy tells us that early intervention in developing gross and fine motor skills is essential. For Boo to achieve anything like typical patterns of movement in his terribly stiff arms and slightly less stiff legs, we have to rewire his brain around the extensive damage he sustained shortly after birth. All his therapies are designed, through repetition and other means, to help lay down new neural pathways to help him achieve or get nearer to the kind of limb function you or I have. Putting a 5 year old who can’t control his arms properly into an electric chair at the age of 5, right when he is starting school, would be like putting a 17 year old in a Le Mans car in kids’ playground. We can all see where that story would end. So the Wizzybug seemed perfect for Boo. Something positive and fun we could start using now with a view to preparing him for the future. We sent off the paperwork and within a matter of weeks were told our application was successful. Boo would be getting a Wizzybug. A few weeks later I went to Kidz South and he tried one out. He loved it and put a smile on everyone’s face, even the conference goers he was trying to run over with alarming enthusiasm. Within a few months, Boo and I made the trip up to Bath to be fitted for the Wizzybug (or Ug-Ug as he calls it) and we brought it home. I confess I was a bit nervous about the fitting before it happened. What if they didn’t think he was a suitable candidate once he got in it? What if he couldn’t use it? I needn’t have worried. The meeting with Nina, an OT for Designability and Martin, one of its engineers, was terrific. And Boo had a ball. The Wizzybug supports Boo brilliantly. We have various bits of very supportive postural seating for Boo at home, much of which looks pretty industrial, so I was a bit sceptical that the Wizzybug could do all it needed to to keep the man with the marshmallow trunk upright. But it does. The harness is almost identical to the one on his buggy, the thoracic supports do their job, and the ankle restraints keep him in that 90/90/90 position we have become slightly obsessed with. The main challenge for Boo is the joystick. And this is a big part of why we wanted the chair so much: to get him working on using one now as this is never going to be easy for him. For many children with CP who have reasonable to good hand and arm function, this would be a piece of cake. But for Boo who has really tight arms, which often contract before he is able to reach forward, it really isn’t. Martin and Nina spent a good 20 minutes looking at this, adjusting the angle of the joystick by moving the armrest and putting a ball joystick on rather than a stick. The challenges haven’t gone, but they have been significantly reduced. Boo spent the entirety of the fitting whizzing round in circles (I am assured every child does this), squealing with delight and increasingly going forwards and backwards. I had tears in my eyes and a lump in my throat. Independent movement. It’s what I want most in the world for Boo. Once upon a time I was fixed on achieving this through crawling and walking. Like I say, I haven’t given up on these things, but powered movement is just as exciting and liberating. The Wizzybug is starting to transform Boo’s experience of the world and it is a joy to see. We left Bath after a very helpful demo on how the chair works, how to work the parental controls, how to dismantle and reassemble it for moving up and down stairs (it is heavy) and armed with lots of practical hints and tips. We left with me slightly worried I wouldn’t remember it all (I did – it’s really easy to use and the manuals tell you all you need to know anyway), but also on a real high and still in disbelief that the process had not only been so smooth but also completely enjoyable. The Ug-ug now enjoys pride of place in our dining room, parked next to the sofa. The Boos have covered it in stickers (we were told we could) and we get it out 3-4 times a week. Because we have steps up to our front door and are still awaiting a much needed lift, we haven’t taken it outside yet as much as I’d have liked, but we’re getting there. And in any case, going round the living room is just as exciting for Boo. For him, the joystick is still a challenge. He often doesn’t go where he wants to first or second or even fifth time round. But he is getting better at using it each and every time he tries it. His spatial awareness is improving. We are using simple commands like ‘push forward’ and ‘pull back’ and you can tell he knows what they mean. He is slowly learning to override the wappy signals (that’s totally a medical term) his brain sends him in order that he can do what he wants to do. And that’s what the Wizzybug is all about. A glimpse of independence for a little boy whose life is otherwise largely dictated by his body and other people. Boo spends every minute in the Wizzybug hollering in delight and yelling ‘more’ or ‘go’. He gets to touch leaves in the park and books on the bookshelf in our living room. And one day, I hope he will be able to drive himself to the park with us following him. I can’t think of anything I want more in the world, actually. So thank you, thank you, thank you, Designability for the Wizzybug and for their fundraisers who work so hard to make this life-changing product available and affordable for families like us. 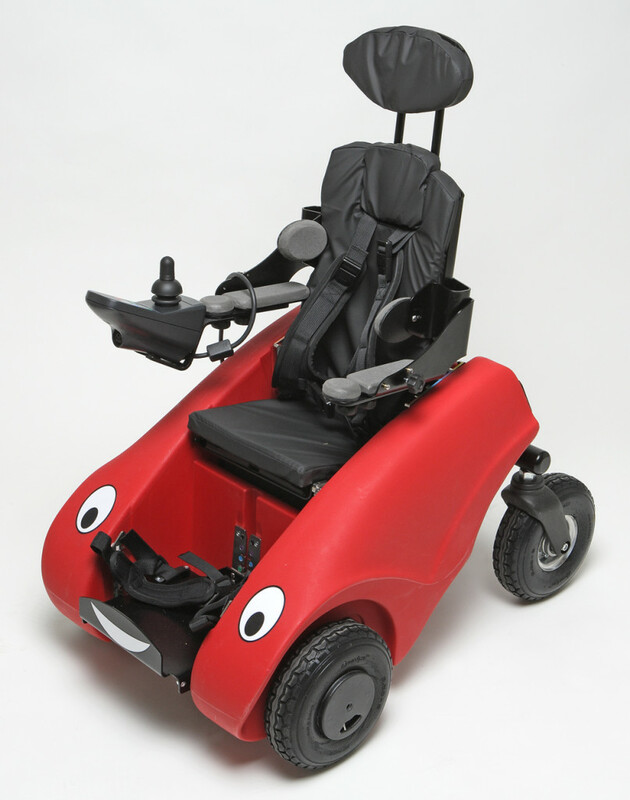 If you’d like to know more about the Wizzybug, or how you can support Designability’s work, please visit their website. And I promise to keep you all updated with Boo’s adventures in the amazing Ug-Ug. This entry was posted in Uncategorized on October 29, 2014 by mrboosmum. What an amazing company, and a gorgeous chair! I can just picture Boo whizzing about it it. Reblogged this on rozihetheringto's Blog. I am actually crying! I am SO pleased that you have had good news, and this sounds like such a massive help. I am so glad that there is this scheme, and that you heard of it. I am sure the joystick will be got used to.